There´s no such thing as too much control. 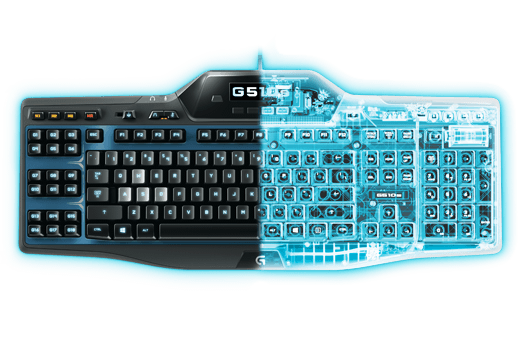 G510s includes 18 programmable G-keys that make complex actions simple by allowing you to configure up to 54 unique functions. Extend your cockpit to include less critical mission intel with the GamePanel LCD. Custom backlit keys allows you to assign a unique color to each profile, profile mode and mode style in the same game. We know games aren’t the only thing running on your rig. Control music and video without dropping out of the game. Convenient one-touch controls put instant access to volume control, mute, pause, play and forward all within easy reach. During the heat of battle, there are times when you might need to simultaneously run, strafe, select a weapon and open a door. Multi-key input on the G510s means complex moves are executed exactly right every time. Press up to six keys at once, each registered perfectly. And the anti-ghosting means you never need to see a command you didn’t intend. When milliseconds could mean life or death, G510s is four times faster than other standard USB keyboards at a 500 Hz (2 ms) report rate, giving you the performance you need. Convenient one-touch controls give you instant access to volume control and media playback without needing to press a function key.